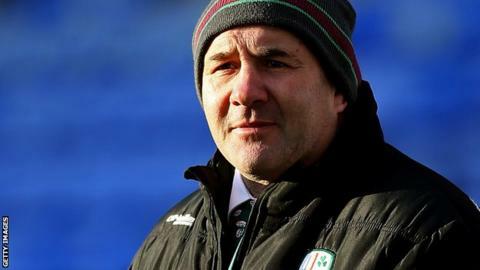 London Irish head coach Tom Coventry admits their meeting with fellow Premiership strugglers Worcester will be a "huge" game for his team. Irish slipped back to the foot of the table after defeat at Sale and Newcastle's win against Harlequins. The Exiles host 10th-placed Worcester on Sunday and could move above the Warriors with a win. "We've already spoken about next week and what we need to do," Coventry told BBC Radio Berkshire. "The boys have had a bit of a hurry up in the changing room. We've spoken about how disappointed we were with our second half performance (at Sale)." Irish conceded 26 unanswered points in the second half as Sale ran in a total of six tries at the AJ Bell Stadium. It was the second time in their last three Premiership matches Irish failed to score any second-half points. And following news that prop Ben Franks will be ruled out until late April with a ruptured bicep tendon, Irish have been hit by a further injury to winger Alex Lewington. The 24-year-old is expected to be sidelined for up to six weeks following surgery on a fractured thumb. "Injuries are a big part of the game, we have to rely pretty much on the squad that we've got," Coventry added. "We can't lament our losses too much, we have to get on with it. "Losing Ben and Alex is a frustration, but we'll just have to manage without out them until we can get them back on the field."